I'm always amazed at those who study climate change. How congenial and patient they are as they tell us of the catastrophic direction we are taking the earth. They are messengers who, like most messengers through history, are being roundly ignored by most of humanity. They must go home at night, after yet another long day of throwing compelling data at the global wall of indifference, and scream into the dark. The Scream is a famous painting by Edvard Munch. I think of it now, and learn from Wikipedia (http://en.wikipedia.org/wiki/The_Scream) that its inspiration came one evening when the sky suddenly turned blood red, and he "sensed an infinite scream passing through nature." "The person in the foreground may be the artist himself, not screaming but protecting himself or itself from the scream of Nature." That is the scream that some of us hear right now, as humanity goes about its business of slurping and shoveling fossil carbon out of the ground and spewing it from tailpipes and chimneys. 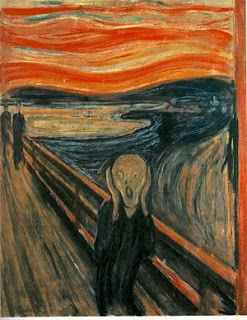 How fitting that, as industrialization gained speed in the late 1800s, the source of Munch's scream was the sky, whose disturbing color may have been caused by the eruption of Krakatoa a half a world away. Munch wrote that he was walking with two friends at the time, and that they "walked on", apparently unaffected by the scene whose visual power left Munch physically stricken. And so today we are left to ask, why do so few see and react to the emergency we face? Why do so few of us hear the scream? If you're looking to improve your soil or put attractive, dark mulch around your flowers and shrubs, you can get composted leaves and/or twice-ground, composted woodchips for free about 5 miles out of town at the Ecological Center in Lawrence Township. Most of Princeton's leaves go there in the fall, and if you can borrow a friend's pickup or figure out some other way of carting it back, you're in luck. For $9/yard during weekday hours, they'll load it on your truck with their front-end loader. No cash accepted. Take a checkbook. If you want it for free, take a pitch fork or shovel along. Location is 3701 Princeton Pike (called Mercer in Princeton), and hours this time of year are 7:30 to 2:30 M-Sat. More info are at http://www.princetonboro.org/polDoc.cfm?Doc_Id=161. According to the man on duty, the Center gets maxed out from all the leaves coming in in the fall, and does not accept the mixture of leaves and brush the town crews collect from Princeton streets this time of year. All of that goes to a private business a mile or two further down the road.